Life with Bethie the Boo: Bring on the uber long weekend! Bring on the uber long weekend! And just like that it's Friday again! I thought it called for a cute new shirt I haven't worn yet. I bought this back in May at the Band of Thrifters sale and just haven't had the chance to wear it yet. But it's going to be hot again, so it was a perfect day to pull it out! It's my new favorite I think, it's so cute and also comfy. 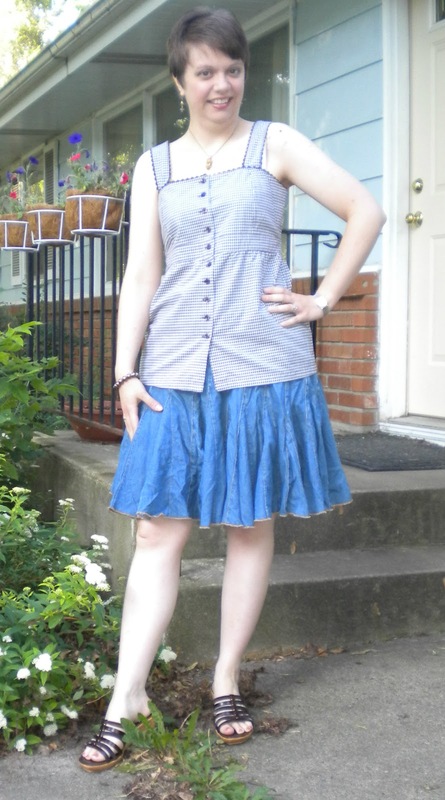 And it works well with my favorite flirty jean skirt! Pretty excited today, not only is it Friday, but I have three days off next week! I took Monday and Tuesday off in edition to the 4th of July holiday. I do have to work Thursday and Friday so my boss can also have a couple of days off, but I don't mind. It'll be slow and quiet and I can just read a book and pretend I'm still on vacation. I get to see a bunch of my old sorority sisters this weekend for a birthday party and I'm looking forward to that. Three of them live out of town now and I don't get to see them very often at all, so it's always fun when we can get together. Sunday it looks like the Pants Monkey will do some beer brewing. I have fun plans for Monday, Tuesday and the holiday itself too, so I should have myself a nice five day weekend! Now I just have to hope today goes by quickly enough. I am sure it will be one of those days that I'm watching the clock like a hawk! I hope you all have fantastic weekends! I will still be blogging on my days off! I love your cool top Beth:) Have yourself a fab weekend! Cute top! You can read at work???!!! How awesome is that?! I love the swooshy skirt! So cute. I used to have a job where I could read - no more! i can't believe you have such a long weekend...jealous! enjoy it, it sounds like you have a ton of fun stuff planned! That top looks like it would keep you cool in this heat! I'm so jealous of your extended weekend...enjoy! 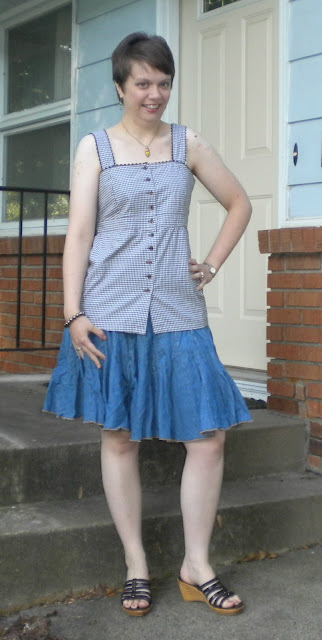 I like gingham, it's very charming and lovely for hot weather! 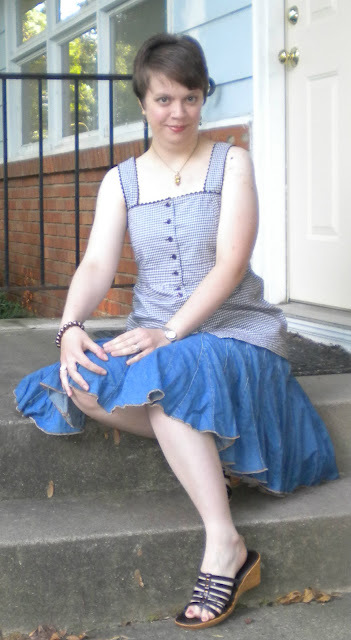 The blouse is very cute with the flouncy skirt. This outfit does look perfect for the hot weather. Enjoy your action packed weekend! I'm looking for a little R&R during the holiday. No big plans, but something will probably come up. That sounds absolutely lovely- I'm excited that I have a 3 day weekend but 5 days is even better- you can get so much relaxing done! Adorable top and so cute with the jean skirt- would make a perfect date night outfit! That is a cute top. And that little wedge sandal is totally right up my alley. Have fun at your sorority sister get together and your leisurely days off. No post yet today?! Where'd you go?! Inspiration Monday - Can it be the weekend again?